Runners, rejoice! LifeBeam sells a $99 hat that will track your heart rate, steps, calories and more. It’s on sale now and will ship before the holidays. I like the look of the hat, and imagine most consumers will appreciate the friendly approach to data — namely, instead of just counting steps, it offers advice and insights via a companion app. LifeBeam already offers similar tech inside a bike helmet. The most interesting thing about the hat and the helmet is that they are merely a showpiece for the company’s technology and algorithms. LifeBeam, an Israeli company, has a two pronged-business plan. It will sell to clothing manufacturers and fitness companies as a sort of Intel-inside for the activity tracking tech. It will also let technology manufacturers license its hardware and software and incorporate it into their own wearable products such as smartwatches or other gear. LifeBeam already has customers in both segments, and by the middle of next year we’ll see the its tech inside clothing and athletic wear from major manufacturers and experience it in electronic devices. While LifeBeam is playing it smart by going after both the tech market and the fitness gear purveyors, CEO Omri Yoffe is betting that within five years, the tech sellers will be niche players as Nike, Under Armour, Speedo and other large clothing companies make a play for this market. 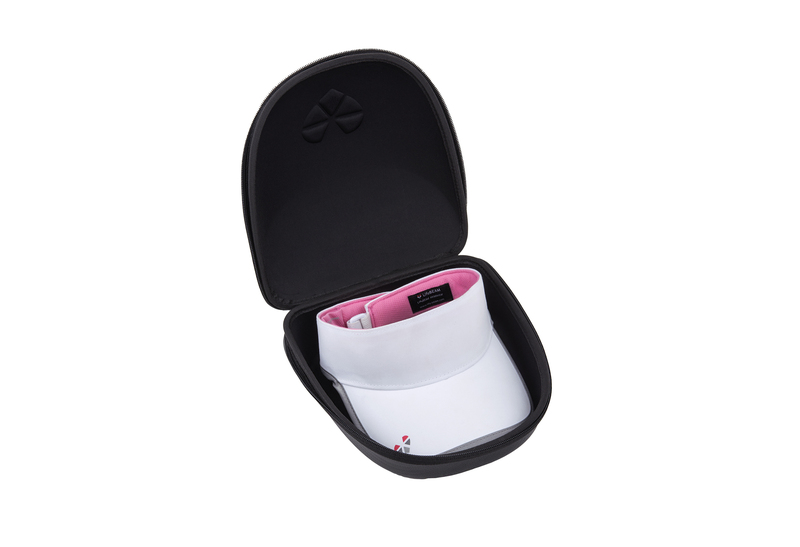 The LifeBeam running visor and case. “When people want to manage their life or health better, they shouldn’t have to put an earbud in or a watch on,” Yoffe said. “This market will be about invisibility, putting tech into your existing gear and totally hiding it.” (To hear more about wearable design check out our design conference Roadmap later this month in San Francisco). So while you may have an electronics pack you clip into a pocket on your gear that will communicate with a watch or smartphone, you won’t have to use dedicated gear for your activity. Instead, a tech pack might move from your goggles to your bike helmet to your running tights and you will choose your hub that it communicates with as well as the apps. As for the apps, Yoffe believes that the focus should be less on raw data and more on algorithms that tie the data together to help coach the athlete. So combining your heart rate data, respiration and past performance might indicate that you could run a bit faster. Instead of forcing you to think about that, the LifeBeam software can tell you to speed up. It’s similar to the next-generation fitness coaching apps like Moov (which gained a $3 million funding round last month). The emphasis on providing smarter algorithms that deliver insights over data makes sense, given how quickly the hardware side of wearables is expected to become a commodity. But Yoffe isn’t worried about that. In fact, he’s betting it will happen, which is why he’s spending so much time on the data and the experience designs for the LifeBeam application and software. It’s also why he’s opening up the experience to other apps, so people can build compelling experiences on a LifeBeam platform. And while the sensing technology is tested by doctors and used to train and track military pilots, it’s generally true that cheaper cannibalizes better over the long term. LifeBeam was formed in 2010 and raised $2.6 million in a seed round two years ago as part of its move from the defense market into the consumer arena. It’s profitable and is selling “tens of thousands of units” of its hats, helmets and visors, according to Yoffe. From here, the company seems to have the right outlook for a segment of the market where change isn’t just guaranteed, but happens every season. Fashion moves much faster than technology, so figuring out how to integrate the two seems to demand a flexible and open approach that will let the device fade into the background and work across a variety of devices and operating systems. As we’ve been saying all along, the data and what companies do with it will be the key element here, not the device or wearable itself. On the hardware side same basic thing , a few sensors that offer rather low value to a niche. This can’t be the future , if there is a future it has to be a lot more compelling. How you market it mattes less ,there are options. There is also no reason to have the same sensors in many objects , one device is more than enough (glasses or watch or phone for those few sensors mentioned here). When it comes to a hat, it would be a lot more useful if we used technology to make it fit better or adjust permeability based on temps and humidity or even color and transparency. At this point it is getting ridiculous ,everybody is sticking the same 2-3 sensors into everything they can think of and we are supposed to get excited. The thinking is “where can we put some sensors” not “how can we make X object better”. Uvex snowstrike VT ski goggles that change color based on weather are a nice product (but not cheap). They might not be about sensors or big data but they are actually useful and appealing to potential buyers.Sure they could get a lot smarter, display info, add sensors including a cam and eye tracking but they already are a viable product. IoT and wearables are not the same thing as big data and people need to stop trying to just force big data into everything. Solve a problem instead, it’s easier and sells a lot better.